"My husband and I were undergoing significant renovations to our home, and wished to have a window seat for our bay window in our dining room. 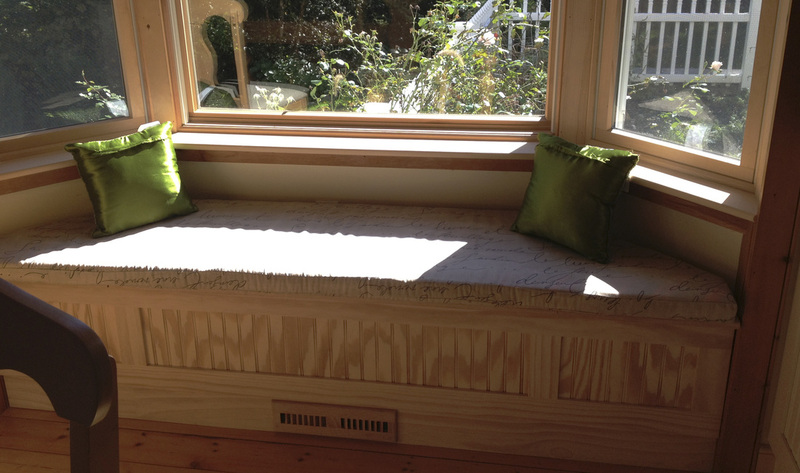 The contractor quoted a large amount to build a custom bench....so we researched on the web and found Sawdust Therapy. We liked the image of the bench displayed on their website and began communicating with Greg (owner) via email....he gave us a rough cost estimate based on what we described. He than provided instructions of how to measure the bench and provide additional details as to the type of seat we wanted: the wood, its finish, the opening, the pillow top etc. Following his instructions my husband provided a template of the area, that lead to a subsequent revised estimate of the seat and the optional pillow top (very consistent with original estimate). We had fabric for the pillow delivered directly to Sawdust Therapy. Our expectations were exceeded- we love the seat, love the pillow top (for which they provided Velcro fasteners to stay on), the item fits perfectly, it's beautiful, it is well constructed, the process was on time, conducted in a professional manner, stayed within budget,delivered via freight (extremely well packed) timely, and we could not be happier. "Thank you for your beautiful workmanship! We will spend many days sitting in the sun, entertaining, etc."